This update includes a new map, a new vehicle and some major graphical enhancements to the game and is available to owners of the game for free through Steam. The new map - Krivoi Rog - gives players the largest tank slugfest to date, with 16 square kilometers of terrain, 3000 meter viewable range and up to 50 players. This map also features the new vehicle - the German Panzer IV G, providing the German players with some additional fire-power for the mid-war period. In addition to the new map and vehicle, an all-new adaptive bloom system has been added for the game's graphics, making the bloom crystal-clear even at low resolutions. For further eye-candy, Anti-Aliasing and Anisotropic Filtering settings are now configurable in-game. "Smolensk Stalemate": the contest winning map features perfectly balanced to-and-fro infantry combat through ruined villages and trenches in August 1943. "Leningrad": features close-quarters infantry fighting in the ruined streets of the city, above them in the bombed-out buildings and deep beneath them in the sewers, all with close-in armor support. "Berezina": the After-Hourz team surpass themselves on this rural/village map, introducing not just a new vehicle (the Russian BT-7 light tank), but also the first functional anti-tank gun in the game. To cap it off, the BT-7 even carries tank-riders. "Black Day July": one of the very best for tank combat fans, set in the rolling countryside around Prokhorovka as German and Russian armor clash en masse during the Battle of Kursk. Increased player limits. A new level of intensity with 50+ player multiplayer battles (up from the previous limit of 32). New community made content, including the Russian BT-7 light tank with infantry tank riders and the first player controllable anti-tank gun in the game. 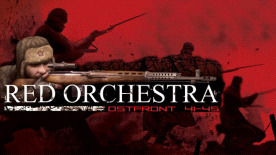 New soundtrack: The "Orchestra" comes to the Ostfront - the game now features a complete in-game soundtrack from composer Matthew Burns. Gameplay enhancements. The addition of several features requested by the clan/ladder/league community to enhance competitive play.